A solid pair of waders makes a world of difference when you’re out fishing. Being able to go out deeper into the water and keep your feet dry will help you catch significantly more fish. A good pair of waders should be comfortable, keep you cool, be durable, and not leak. A budget of 200 bucks can get you a very good pair of waders for wading that next trout stream. The list that we have chosen all contain some of our favorite picks, and ones that are highly reviewed. If you’re interested in finding the best waders under 200 dollars, continue reading. This simple little table will overview the choices we have made for the best waders under 200 dollars. Frogg Toggs is a brand that has really made it’s emergence in the last decade or so. They manufacture many high quality rain suits, waders, towels, and more. They have become known especially for their lightweight rain gear, which is lightweight and breathable. Their waders are also quality pieces of fishing equipment. These specific waders are 3.5mm neoprene, which is a waterproof material that is also a very warm material, making them great for three seasons in most places, fall, winter, and spring. If the water is chilly enough where you fish through the summer, these will work for that as well. However, neoprene gets very warm if it’s hot outside. The design of the foot is a boot design with rubber cleats on the bottom for grip. This saves you the money of having to purchase an expensive pair of wading boots. The knees are reinforced for extra durability. The waders only knock on these seems to be the sizing, as they run tall. If you are tall for your shoe size, they should work well, but just beware they may be a little tall if you are a shorter person. Another pair of 3.5mm neoprene waders, the Hodgman Caster waders are highly reviewed. These are slightly cheaper than the Frogg Toggs waders, and they also come from a renowned manufacturer of waders. Hodgman has an excellent reputation for turning out nothing but the best of the best. As 3.5mm neoprene thick waders, these waders are ideal for chilly conditions. The neoprene is plenty to keep you warm down to the freezing point, beyond which you should go with 5mm. They have a cleated boot as well for extra grip on rocky surfaces. The boots are insulated with 200 grams of insulation to keep your feet warm. These also have a fleece lined hand warmer pocket for when your hands inevitably get cold. Hodgman offers a year limited warranty against manufacturers defects, so if it seems like a thread comes loose, send them in for a replacement. 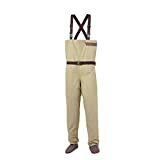 If you’re more an average or short height, these waders are the way to go, but if you are taller, go with the Frogg Toggs. They are very similar waders otherwise. Finally a pair that is thinner for summer and warm condition fishing! The Crosswaters are made by another well-known manufacturer, one that is a name brand in the fly fishing industry, Redington. These waders are made of 3 layer nylon for comfort and durability, while the boots are made of neoprene. The reason for this is you can choose a pair of wading shoes separately that you like to put over the neoprene shoes. Reviews also say these fit well out of the box. As a more lightweight pair of waders, these are ideal for warm weather conditions. If that’s what you are looking for, these waders would be the best ones for you! You can purchase a very good pair of fishing waders for well under 200 dollars, as we have shown here. The right ones to go with are the ones that fit you well and work for your fishing conditions. Waders are a great way to expand your fishing range. We hope this guide on the best waders under 200 dollars will help you when you’re picking up a pair of waders.